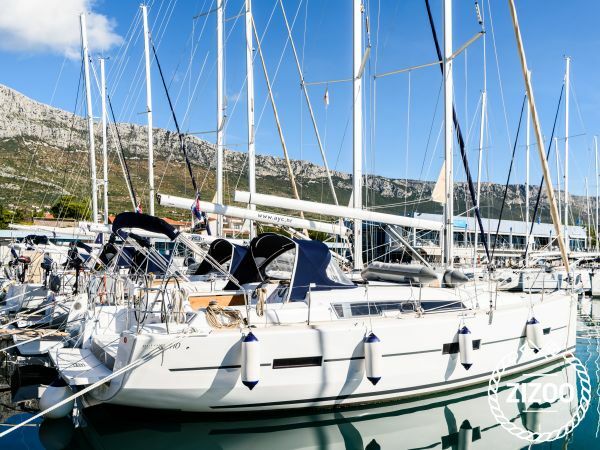 Located in the picturesque seaside town of Kastela in central Dalmatia, the 410 Grand Large by Dufour is the ultimate cruising vessel for you and up 7 other guests. Featuring Dufour’s signature sleek design, the 410 GL combines innovative technologies with comfortable, yet sophisticated living areas. The split cockpit gives you and your crew plenty of space to relax under the warm Mediterranean sun. Set in between the popular cities of Trogir and Split, a yacht charter in Kastel is an ideal destination for island hopping around the Dalmatian islands and discovering nearby coastal cities. For a more relaxing trip, we can arrange a skipper or hostess for your holiday. Me and my family rented this boat for a week and had a wonderful time. The best of all, we could bring our dog with us! Waren mit allem sehr zufrieden, die Elan war das perfekte Boot für uns. Danke!